Traditional,. 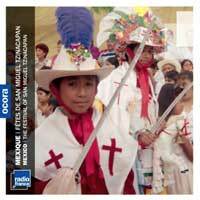 local music from a Nahuat village situated in a lush, mountainous region in Puebla Stae, Mexico. The language spoken in this village is related to Nahuatl, a language more commonly known abroad under the exotic name "Aztec. "In Nahuatl, Tzinacapan means "Bat Springs." As in all the villages in the Sierra Norte of Puebla, life in San Miguel Tzinacapan follows the agricultural rhythms of maize and coffee and the ebb and flow of the fog banks that relentlessly blot out and recreate its landscape.